I seem to have lost track of the center vent mount... I can find the Speaker Plate in the electronics mounts folder, the VentPanel in the Main Frame folder, and the Upper/Lower Front Vents in the Greebles folder. What part is this/where is it located? 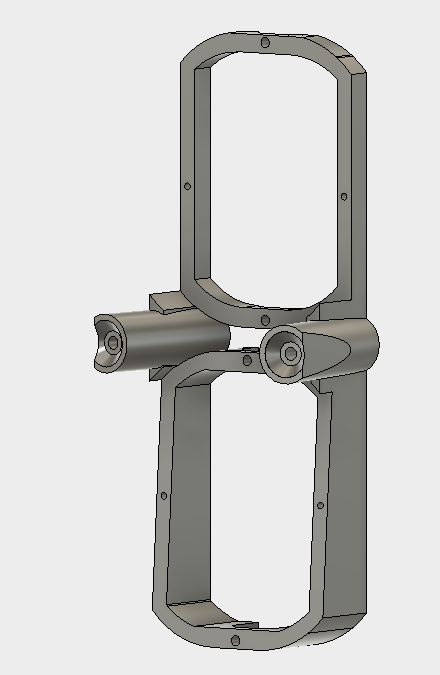 It's called FrontVentBracket.stl - it used to be in the Body/Greebles folder, but I don't see it there any more. I was so missing this part!! thanks!! I'm still printing this part, so I'm not sure how far back the speaker plate will actually sit. It looks like the (awesome!) CBI mod I'm using from Eebel might cut into the space used by the speaker plate by just a few mm. I've modified the speaker plate to compensate, and will post once I actually get all of the parts printed and test fit. I'm extremely grateful for Michael for posting his Fusion360 videos, this is fun! It was removed by Michael I think due to the 2-3-2 configure. I glued mine to the front plate and then used the speaker mount which goes on the back to lock things down. According to Michael, the new speaker plate and baffles will hold the vents. In my droid, I'm using both the speaker plate (no baffles) and the vent bracket. I'll leave the link to my copy of the bracket, just in case anybody finds it easier to use. Thanks Larry... I've been looking for this part as well. I didn't use this part at all. I just hot melt glued the speaker mount and the flex-plastic spealker baffles.